Why Team Frames Trade & Retail? Our ethos is to provide only the very best advice and superior workmanship, regardless of which choices you make from The Adorn Range. 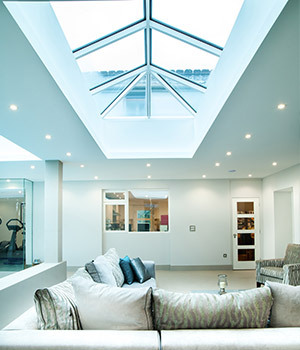 We know how hard the home improvement process can be, so we take away all of the associated hassle, work alongside your builder, architect or interior designer. We positively contribute to your process with our outstanding customer service and proven customer satisfaction. We are not just self-confident about the quality of our work, we stake our reputation on it. We provide as standard a 10 year comprehensive guarantee for product and workmanship for every project. Our customer service doesn’t just start from the first point of contact, but with all prior advertising of product and service - informing, updating and demonstrating amazing benefits. We offer genuine advice and guidance from security and energy efficiency, self-cleaning glass, durability and technological advancements to keyless entry and finger print recognition; questions you may not have yet asked yourself. With hundreds of colours, textures and styles to choose from there are a variety of options across industry leading products. We are continuously looking out for you every step of the way, from site survey, pre and post installation to a satisfaction feedback follow up call – we want to know how you really and honestly felt about every aspect of our relationship. With your consent, we sometimes use you project as a case study, as recently advertised in National homebuilding media publications – see Certified Installer Network. We care about our customers – and want you to make the most of your property, whatever shape, style and size it is from country cottage, street facing town house, detached to bungalow. Utilising your space, opening your property to your garden a bespoke combined living environment. We promise to do all we can to achieve complete satisfaction. Our customers love the end result and you too can gain a more comfortable, stylish property that you will be proud of for years to come. What are our main values?